Thank you everyone for the help! I bought a tension rod, and David and Nadine’s (and Julia’s via email) suggestions made me remember I had these clip things and voila! 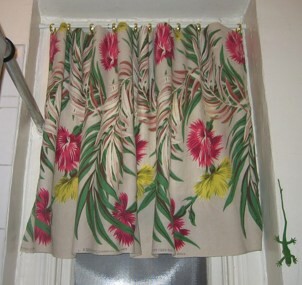 A pretty bathroom curtain. I handed in my book yesterday, so I’m trying to do mostly fun stuff for a few days. I have to start working on this NPR piece I’m doing, but that’s fun so that’s okay. Did I mention the topic? It’s audio forensics. These are people who listen to recordings and try to solve crimes, figure out why planes have crashed, investigate terrorists, etc. Very interesting. Audio detectives. And in some cases, audio archaeologists. I added a link to a Petfinder script, which randomly links to pets for adoption in New York. I wonder if it will ever lead to pets being adopted, but might as well try. Congrats! And I love the gecko too. There are video forensic experts too. My husband works in security and told me of this expert they had one time who talked about what you could and could not do with video. Apparently, tape is easier to manipulate (so you can get detail) than digital. But you can NOT do what they do in the movies! Pixels is pixels. Julia, yeah. They always exaggerate in the movies. That’s interesting about analog vs digital.